Memorial jewelry helps commemorate someone who was important to you and keep them close to your heart. 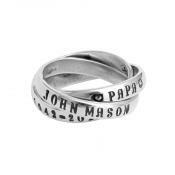 Create a customized memorial ring stamped with a name, date or anything scentiment you share with the special person. 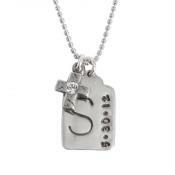 Memorial jewelry helps commemorate someone who was important to you and keep them always close. 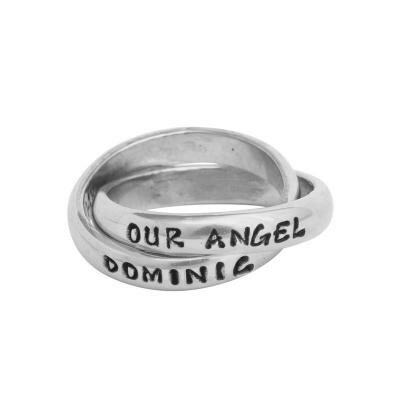 Create a memorial ring by customizing our double band ring with words, phrases or memories you shared. Be creative - you can put one word on each band or put a whole phrase using the two bands stamped with part of the phrase like "Always in my (heart symbol)" or "Always and 4ever"
We also have the symbols or a heart and cross which will further enhance your customization. I am so very happy with this memorial ring I just bought. I lost my father about a year ago, and we were very close. This is a wonderful way to keep him in my thoughts, and to always remember the great dad he was!! The quality is awesome!! I love all products I have purchased from Nelle & Lizzy!! The wording is always beautifully engraved! I cherish all of the pieces of jewelry I have received! !